There are several legends from different cultures about how herbal teas were discovered and how they were to be used for health and pleasure. It is certainly one of our oldest medicines. But just what is herbal tea, and why have we used this method for so long? 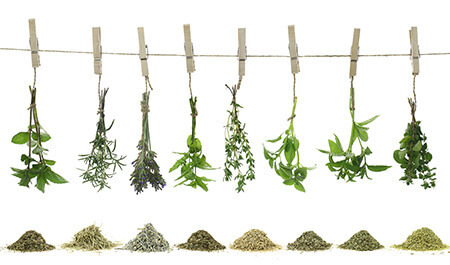 Which herbs should you choose for your herbal teas? We’re going to explore all of these questions. By the end of this piece, you should feel comfortable with ordering and using herbal teas. First, we need to explain some technical language. Camellia sinensis is the plant whose leaves are processed to make all of the standard types of tea that you see in the store. Herbal tea is the standard term for any liquid where any plant besides Camellia sinensis is infused or decocted. Some tea experts get really uptight about using the word ‘tea’ for herbal teas. 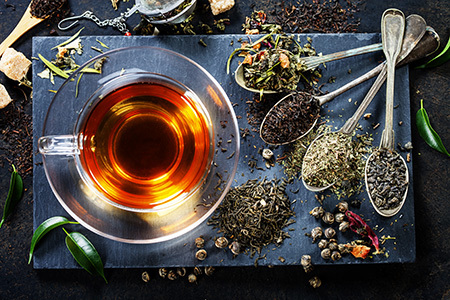 They would prefer to use the word “tisane”, an older French word for barley tea that has since been used for all herbal teas, though that word isn’t well-known. In Asia, on the other hand, they aren’t concerned with the name. The word for all kinds of tea in Mandarin is cha. They just add adjectives to show the difference between green tea, black tea, milk tea, and medicinal teas. It’s all tea to them. How are herbal teas prepared? Unless you follow some traditional herbalist path, you may not know the words infusion or decoction. If you’ve ever made standard tea, you’ve done an infusion. This is when you place plant material in hot water for a few minutes. The hot water draws compounds out of the herbs that give the tea its flavor and action. A decoction is a stronger form of infusion. Decoctions are boiled for several minutes rather than just steeped like an infusion. Decoction is usually done with harder woody materials like roots. Infusion would take too long or not be hot enough to draw out all of the benefits of these materials. In some medicinal combinations, usually doctor-prescribed, both processes might be performed. Roots might be decocted, then once that is done the decoction might be heated so additional herbs can be infused. Most herbal teas sold are infusions to make the process simple for consumers, but if you plan on making your own you need to know how herbalists describe how to prepare the plants. For teas, infusion and decoction are the two key terms. The manufacturer or your doctors will tell you how long to do it for and your water-to-herb proportions. Why not just eat them? Herbal teas are not the only way to get the medicinal properties of herbs. Some can be eaten raw. Others have to be soaked in an alcohol to create a tincture. Still others can be cooked with food for an effect. Each method has its pros and cons. What’s appropriate for one herb may not be good for another. Few people would want to chew on a root as their medicine, but an herbal tea makes consuming the root much easier. Additionally, you can soak quite a lot of plant material into a single cup of tea, creating a concentrate that’s much easier to take than eating a sizeable pile of dried leaves. Where teas really shine is their ability to combine different herbs very easily into the same brew. It’s rare that an herbalist will give you a single herb to take. Herbs have been found to work together in ways that would make them more potent than taken alone. Sir Jason Winters Tea takes advantage of this by combining three herbs together to get its potent effects. By infusing them all at once, you get their combined benefits in one cup. Can I make my own recipes? It is much safer to use trusted recipes created by herbalists than winging it on your own. Some herbs and herbal combinations are extremely potent or even dangerous to use without guidance. Foxglove (Digitalis) is the root of many of the heart medications we use in Western medicine today and has been used by herbalists for centuries, but it is very easy to take too much and cause fatal heart conditions. If you want to craft your own recipes, or add herbs to existing recipes, you need to receive training in an herbalist tradition of your choice. Also, you should NEVER add any herbs or anything other than a natural sweetener to our Jason Winters Tea, as it has been used for about 40 years with the same tried and true formulation. Cayenne – Balances the body, especially weak bodies. Good for cold, rheumatism, and depression. Often combined with other herbs to make them work faster. For a full list of the herbs we use, see the Herbs page linked above. When used according to the directions, herbal teas can be a powerful addition to your diet. We want to invite you to try giving Jason Winters Tea a try so you can experience the effects for yourself. This tasty formula has been used by thousands of people safely as part of their daily regimen. To learn more about it, read our story at the link at the top of the page.